The Multi Quick 5 hand blender from the identity collection gives you controllable and powerful blending with Powerbell Plus technology for extra milling blades and for less pre-cutting and 21 speed controls for single handed use, so you can adjust the speed with your thumb without interruption. 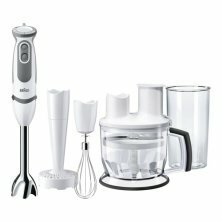 Along with the hand blender, you get a 600 ml BPA-free plastic beaker with ml and fl oz measurements, a whisk, a food processor and a French fry shaper . The Multi Quick 5 hand blender from the identity collection gives you controllable and powerful blending with Powerbell Plus technology for extra milling blades and for less pre-cutting and 21 speed controls for single handed use. It comes with a 600 ml BPA-free beaker, a whisk, a food processor and a French fry shaper .